A second consecutive event was organised in Plovdiv on 21st December 2015 in the format of conference entitled “Human capital development through education and training”. The attendees were 85 in number coming from public administration, daily care centres, sheltered houses for people with disabilities, rehabilitation and social inclusion centres, NGOs, VET schools, and other training providers. Among the participants were also people with disabilities, psychologists, personal caregivers, teachers and trainers, and journalists. The conference started with welcome speech by Veselina Boteva, the Head of Social Services Department under The Municipality of Plovdiv. She declared the readiness of the institution that she presents to keep on using the valuable M-CARE results for training of staff recruited by the municipality. Then the floor was given to the Interprojects LTD team who presented M-CARE final outputs using different attractive tools such as videos, demonstration, and discussions with the audience. The mobile app was also demonstrated using a desktop emulator. The conference programme also included presentations by guests speakers who talked about new pedagogical approaches for education and training of people with disabilities and professionals working with them. One of the most attractive part of the conference was the so-called awarding ceremony dedicated to the organizations who collaborated with Interprojects LTD in order to achieve better opportunities and make people with disabilities more independent and equal citizens. 24 plaques were handed to journalists who disseminated the project, organizations and individuals who supported the implementation of the project and contributed to its sustainability. The conference was publicised by The Bulgarian National television, Daric Radio and Maritsa Newspaper who published materials and interviews with the speakers. Although this was the final dissemination event in Bulgaria of this project our team will plan a number of activities in order to keep the interests towards the project alive. 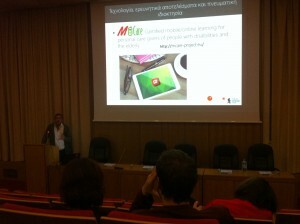 The M-Care application was presented at the Usability and Accessibility days 2015, at the University of Athens (UoA) on 19 December. The event gives the opportunity to the academic society to discuss recent developments in the field of usability and user centered design and share good practices. The New Technologies lab of UoA presented M-Care and had the opportunity to discuss its features with several experts. The app received very encouraging comments for both the gamification features and the multiple ways offered for accessing the learning material, while some expressed their concern that the low penetration of smartphones/tablets among low skilled workers in Greece, considering a challenging fact for future projects focusing on mobile vocational training. 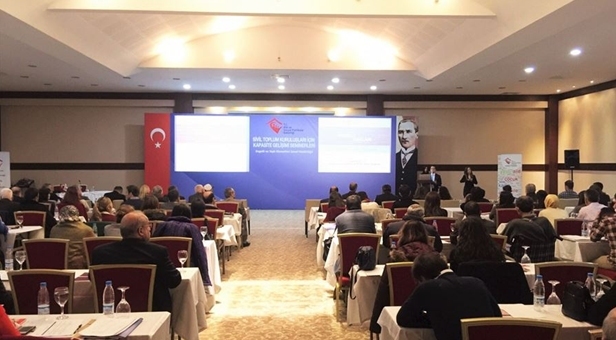 The fourth and the last seminar within the scope of the Project: “Capacity Building Seminars for Civil Society Organisations” was held by Ministry of Family and Social Policy, General Directorate of Services for Persons with Disabilities and the Elderly in Eskişehir, Turkey, between 7 and 8 December 2015. The seminars were aimed at monitoring and promoting the implementation of United Nations Convention on the Rights of Persons with Disabilities by the relevant stakeholders. The participants of the seminar included representatives of civil society organizations working in the field of disability, representatives of General Directorate of Services for Persons with Disabilities and the Elderly. Approximately 80 persons attended the seminar. The presentations made in the seminar were mainly focused at providing a rights based approach for disability studies, eliminating possible inadequacies in the capacity of CSOs, strengthening the structure and operation of disability CSO’s and providing information and raising awareness on the implementation process of Convention on the Rights of Persons with Disabilities. M-CARE project was promoted in this seminar through a short presentation on the current situation of the project in general and the outputs of the project. The participants were informed about activities and the partners of M-CARE Project. Information on the mobile application and the website of the Project were also announced to the participants. On 18th December 2015 Interprojects LTD team held the Final Certification Event of the project in Imperial Hotel in Plovdiv, Bulgaria. 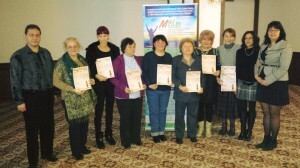 It was attended by all trainees who actively participated in M-CARE pilot phase in Bulgaria. Their feedback and contributions were valuable and helpful for finalization of the training modules. Personal and social assistants of people with disabilities employed by The Municipality of Plovdiv recognized the learning content as useful and practical. They also tried the quizzes and other additional training materials highlighting the importance of sharing experience and good practises among personal caregivers. Besides the gathering of feedback there also was an official part for handing the M-CARE Certificates for Participation. The participants were pleased to receive acknowledgment for their participation in piloting. They shared that such certificates contribute to their professional development and strengthen the opportunities for their promotion. The overall atmosphere of the event was friendly, positive, and productive. At the end of the meeting Nina Bankova, who is a chief expert in Social Affairs Department under Plovdiv Municipality, confirmed once again that the collaboration between Interprojects LTD and the Municipality will continue and M-CARE training materials will be further used for induction training of newly recruited personal and social assistants. It opens new perspectives for exploitation of M-CARE training programme as in the next year European Social Fund through operative programme Human Resource Development in Bulgaria will fund more than 300 work placements for personal caregivers on the territory of Plovdiv region. These newly hired practitioners will need a proper training in order to serve their clients with disabilities in a secure and qualitative way. Thus near the end of the project the Bulgarian partner ensures sustainability of M-CARE by achieving agreement for future collaboration between our team and the local authority responsible for personal care services on the territory of Plovdiv region. We will keep you informed about all relevant news regarding M-CARE development even after its administrative end. On Friday 18 December, the closing event for Bulgarian PCG experts from Plovdiv Municipality Social Services took place, thanking them for their extensive contribution to the M-Care project. Interprojects and PhoenixKM staff issued certificates and expressed continued support to ensure continued usage of M-Care online and mobile platforms. University of Athens had the opportunity to present the M-Care mobile application at the Games and Learning Alliance conference (GALA 2015), in Rome on 9th December. GALA is an international conference dedicated to the science and application of serious games. The conference is organized by the Serious Games Society, which is building a scientific community at international level for shaping future research in the field. This community represents a significant blend of industrial and academic professionals committed to the study, development and deployment of serious games as really useful and effective tools to support better teaching, learning, training and assessment. 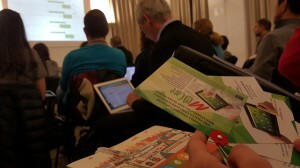 The app was presented at the Games for Health workshop, focusing especially on the adoption of gaming techniques in situations where health and well-being are involved. On 1 December 2015, the final M-CARE conference was organised in Brussels, Belgium at VLEVA premises. The event “Caring for people with disabilities and older people: challenges, opportunities and (mobile/online) training solutions” focussed on the importance of good quality personal caregiving (PCG) for people with disabilities and older people. Focus was on caring in a broader perspective, and how M-CARE’s (mobile/online) training solutions can contribute to successful PCGs. On 13 November 2015 the team of Interprojects LTD attended the Annual Assembly of VET School Directors Association. We were specially invited by the Ministry of Education and Science in Bulgaria to present innovative approaches in education and training that VET teachers can apply in their practices. As the Bulgarian version of M-Care e-training platform and mobile app was completed and already tested we had the confidence to introduce M-Care training programme as a successful tool for training of professional caregivers. The event was organised in the format of consequent thematic sessions where panellists presented their practices and participants asked questions and made comments. In general M-Care achievements were well accepted and several VET school directors shared that they are willing to include the training materials in their educational courses. The event was attended by more than 50 VET teachers, senior educational experts, school directors, and policy makers in the field of VET. 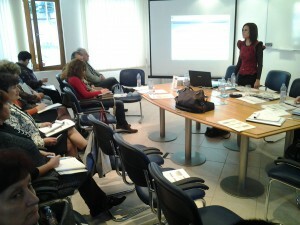 This event considerably increased the chances for sustainable use of M-Care training programme in Bulgaria. Even in the last months of the project the team of Interprojects LTD will keep on disseminating proactively the project outputs in order to keep the interest towards the project alive even after the end of the testing phase. PhoenixKM will attend this event. Professor Constantinos Mourlas presented M-Care project at gi-Cluster Networking Day, in Athens, on 10 November. The event was focused in identifying networking opportunities between universities and the industry. 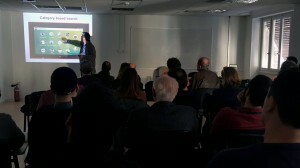 In this context, the presentation focused on the work undertaken under the framework of the project both in academic terms (research, analysis of user requirements, gamification theory) as well as in terms of content and technological solutions production (implementation of the application). About 150 people representing academic institutions, research institutes, and gi-Cluster members attended the M-Care presentation. During the round table sessions the representatives of the New Technologies Laboratory of the Department of Media – University of Athens had also the opportunity to further discuss with the participants cooperation prospects regarding the future exploitation of the project’s outcomes. It is noted, that the gi-Cluster comprises of small and large companies, academic and research institutions, all involved in the Gaming and Creative Technologies and Applications Industry. The completeness of M-CARE curriculum and training content forms the perfect basis for a PA training. In addition, the mobile training and learning approach is absolutely novel, especially also because the learning content can be dynamically adjusted in all languages by the country administrators. These both facts allow for the mobile application to have a long lifespan and extensive usability, while highly customisable. This project (M-Care - 539913-LLP-1-2013-1-TR-LEONARDO-LMP) has been funded with support from the European Commission. This website reflects the views only of the author, and the Commission cannot be held responsible for any use which may be made of the information contained therein.